Seems to work the same way as the newer themes did. Yep. Right click on the number of the post and copy the link. but that's just a normal link. but then again, do we even need permalinks anymore as, iirc, something about post counts got changed but I don't remember what at the moment. the format changed, but it looks like it works like a permalink to me tbh. There's no page number in the link, and the post number is the same. It doesn’t list page number so it should be as good as a permalink. The Threadmarks feature shown in this topic will be useful for OTs and large threads in general, allowing OPs to select the most useful/helpful posts for a drop-down menu above every page. Tbh I think the feature needs to be brought to more users' attention though as it's kinda buried in the middle of that topic which not everyone will even read (both thread makers and readers). guys sorry if I'm asking this in the wrong thread, my account has been created for more than 60 days and i have 100 posts but it seems like i still can't create a thread in the main forum, are there any other requirements? Who is doing EDF5 OT? Did you check the index? Just updating the dates on these. Is there going to be a VGA2018 OT? I was just about to make one. TheMoon my friend Strange won't be able to do the DUSK OT and he wants me to get it, can you sort that up? Still doing this? Game is up in a couple hours for Early Access folk with the release for everyone else on the 10th. Summer is too wide a window at this point. wait until it's narrowed down please. I see sorry I just jumped onto it. Gotta wait then. why are people able to claim these OT's if they don't have a specific date to them ? Imma vouch for Prince since he does make the highest quality Yakuza series OTs on the site. I see no reason for him not to claim it. But that's my two cents. did you read the parenthesis? and can you please trust that there's some sort of rhyme and reason behind these when there are exceptions that don't fit into the preset mould? I'm not here to amuse myself. it has nothing to do with who claims something. it's simply outside of the window. that is all. I'll be back when we get a date. Has anyone claimed Gris yet? If not I am. Also, glad to see Gris will get some love. Well, guess the post was over a year old and not in the OT. I'll get something together then. at one point Luu dropped all claims (may have been via DM) and then reclaimed one or two later, hard to keep track. that might be why. OK, cool. Just didn't want to step on anyone's toes. 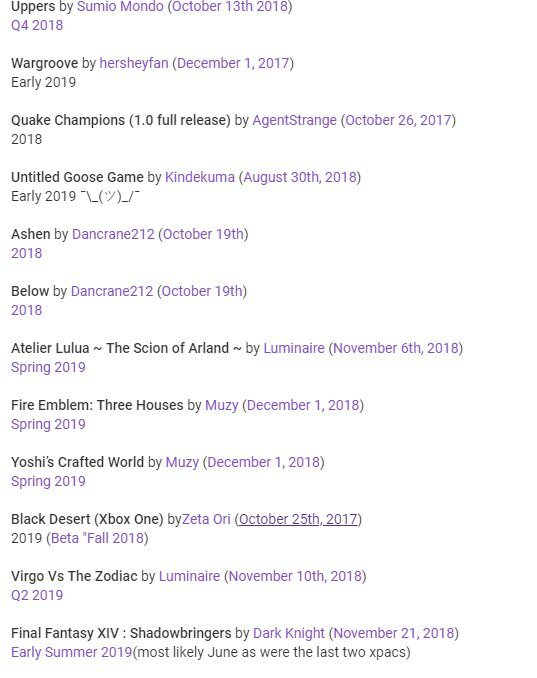 Why isnt Anthem in the Feb 2019 list? Is there a way to search threads for specific posts. I want to do the Jedi Fallen Order OT and that leak a suggested it was coming next November. Obvsiously I have to wait for official dates and what not but I wanted to check and see if anyone had already expressed their desire to make that OT. search -> "this thread only"